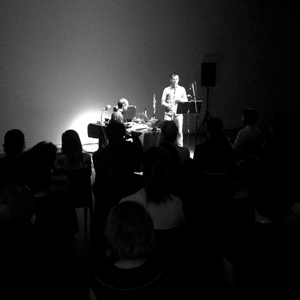 EKG is a collaborative electroacoustic duo with Ernst Karel. The music is situated between acoustic and electronic, improvised and premeditated, disruptive and meditative; it crackles and hums with precariously restrained potential energy. Combining winds with anachronistic electronic processing, EKG carefully sculpts a bizarre yet organic soundworld of shifting tones, sudden and creeping textures, elusive suggestions of possible melody, and microscopic noise. Formed in the hotbed of Chicago’s mid-90s experimental music community, EKG has slowly, quietly, continued sporadic work as Ernst and Kyle have drifted apart across the continent (and, for one short period, the Atlantic Ocean), releasing four full-length albums on another timbre, Formed, Sedimental, and Locust Music, following their debut EP on Crank Satori. Notable performances have included the 2013 San Francisco Electronic Music Festival, the Crow with No Mouth Series (Minneapolis/St. Paul), Bowerbird (Philadelphia), the Stone (NYC), and Non-Event (Boston). Their music has appeared in such video/film works as Rebecca Baron’s Detour de Force and Brett Story’s The Prison in 12 Landscapes. They have recently been geographically reunited as fellow residents of the San Francisco Bay Area, and are continuing a new phase of exploring interpretations, both radical and faithful, of existing scores by composers such as Feldman, Braxton, Lucier, and Pisaro.